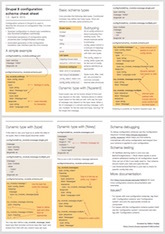 On the heels of my recent announcement that thanks to Raimund Bauer stepping in, the translation template extractor is now a separate project, I decided to look into where does this change need to get propagated into the Drupal Handbooks. 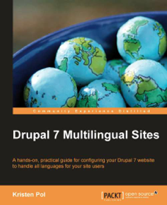 To be honest, I have not really been around in this part of the handbooks before (although I am a lead member of the Drupal Hungarian translation project), and what I found was not actually pleasing. The Translator's guide seemed to be intimidating for newcomers, basic questions are sprinkled all around the guide's pages. The start page was in the first paragraph talking about what is *not* documented there, instead of trying to help people grasp how things work here. So I decided we need a little rewrite, and I should put my keyboard and mouse where my mouth is (pun intended). While writing up the new introduction page, it turned out that a figure would show a lot more than what can be described in a reasonably short introduction (so people will actually read it). 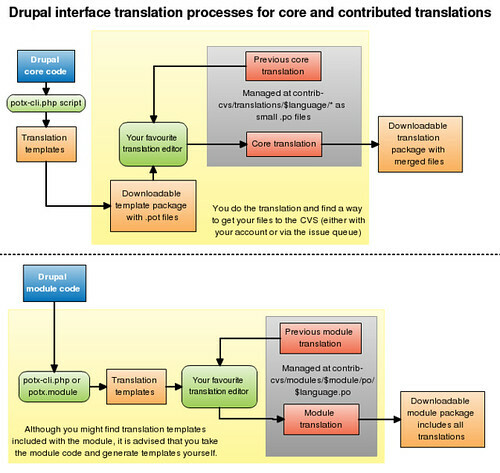 I tried to come up with a figure showing how Drupal core and contrib translations work, how translation templates are generated, tried to emphasize that existing work should be reused, where should translators put these files, and in what package these files will end up in. This resulted in a seemingly complex figure, but with using some hopefully sensible colors and text, I managed to simplify it as much as I was able to. 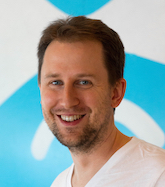 The most important for me was to provide an overview and to communicate the tasks of a translator, and it' connection to the packaging system. Doing the actual figure was easy, given a great tool to visualize my thoughts. Gliffy is an incredibly fun tool, and it does a lot! It is a complex Flash application, so desktop like I always right-clicked (and got the Flash context menu which did not help in creating the figure). It is a free and easy to use online tool to create figures such as the one shown above. And it is not a closed tool, as far as exporting as SVG, PNG and JPEG goes. Unfortunately it does not export in a diagram format, so you cannot reuse your figures in Dia for example, but that was perfectly acceptable in this case.